Pokeshot///SMZ named a finalist for the 2013 Jive Awards! Pokeshot///SMZ has been selected as a finalist for this year’s Jive Awards in the Extend Jive category on the strength of its social learning management solution SmarterPath. We are excited to announce that Pokeshot///SMZ has been chosen a finalist for the prestigious 2013 Jive Awards. 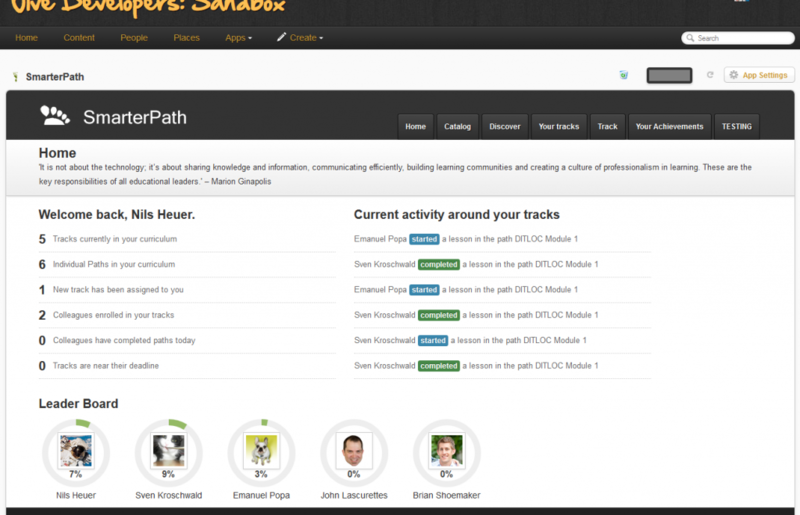 The Berlin-based social software consultancy and technology provider will appear on the final award ballot in the Extend Jive category for its innovative new tool SmarterPath, a social learning management system for Jive. As a leading Jive Partner, we are pleased that our entry in the competition has made the final cut and hope, of course, that we will be called to the winner’s podium. Extend Jive is a new award created by the social business software maker to “recognize an organization that developed a solution leveraging the API and integration frameworks to bring new capability to a platform, change systems of record into systems of engagement, and deliver real results to redefine how work gets done.” It also allows Jive to honor a partnering company that has made important contributions to the evolution of the Jive ecosystem, taking into account factors such as sharing best practices and code and frequently participating in the Jive developer community, user groups, hackathons, open social and other developer initiatives. Traditional learning management systems (LMSs) haven’t kept up with the social business paradigm ushered in by collaboration platforms like Jive. By focusing mainly on the “management” part, these tools lack relevance and are normally used only once or twice a year. What’s more, they include their own social elements, thus undermining your investment in Jive. SmarterPath is the first enterprise level application built from the ground up on the Jive platform, rather than as a standalone system. As a result, it combines the best of social business with powerful corporate learning and enablement capabilities. Instructors can leverage content directly from Jive to build their courses. And participants can progress through learning paths while working in Jive, using familiar Jive features to collaborate with peers. Winners will be announced on Main Stage at JiveWorld13 in Las Vegas on October 24th. We’re keeping our fingers crossed.